Can be installed below the ceiling. 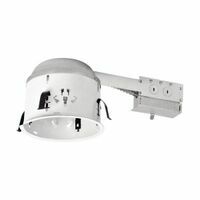 For installations in non-insulated ceilings or where insulation can be kept 3" from housing. Integral thermal protector guards against misuse of insulation materials and improper lamping. 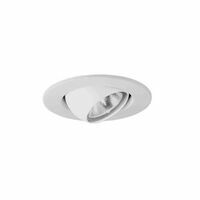 Adjustable socket bracket allows the use of different lamp types and sizes as well as proper and consistent lamp positing. Junction box is listed for through branch circuit wiring and has seven 1/2" knockouts and four Romex knockouts with integral strain relief. Installation: 7-1/2" height allows use in 2 x 8 joist construction. Four remodel clips secure housing and accommodate ceiling thickness from 3/8" to 5/8". Requires ceiling opening per template. Listings: UL Damp Locations. UL Feed Through. CSA Certified. IP Rated.